Proform elliptical exercise equipment covers a wide range of machines in the budget market. The company specializes in elliptical trainers for beginners by focusing on two key areas – keeping the prices relatively low and offering unusual functions to motivate novice exercisers. The Proform 20.0 elliptical cross trainer is a perfect example of their success. It’s actually amazing that Proform elliptical exercise equipment costing only $800 has this many bells and whistles. You’d think that just getting this machine’s programs, 18” stride and other features would push the price close to $1000, but add the games, audio voice trainer and music capability and it’s an impressive feat. UPDATE: This elliptical trainer has been discontinued and isn't being sold any longer. You can find the newest models available here. Fitness pros tend to be wary of some of the Proform elliptical exercise equipment that comes with unusual extras. They don’t like “gimmicky” products, and fear that there’s been a sacrifice in quality to make room for the window dressing. In fact, the stride on the Proform 20.0 cross trainer is comparable to many other higher priced brands, as is the LCD computer, which has been recently restyled. There are very few reviews by consumers on the Proform 20.0 elliptical – probably because, being newly reformed couch potatoes, there is only so much they can take on at one time. Those that do comment admit that the games and music were deciding factors for them because they feared an elliptical would become an expensive coat hanger when they got bored exercising. They all were satisfied with the cross trainer’s performance and felt the equipment was worth the money. You’d think all of the money had gone into the extras that don’t have to do with actually working out, but you would be wrong. Compared to lesser priced Proform offerings, this is a more stable, smoother ride and seems to hold up well for a reasonable length of time. It isn’t noiseless, but it is tolerable. 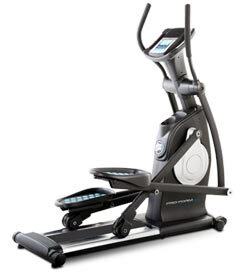 We say, if you need to be entertained while working out – go for the Proform 20.0 cross trainer. Hey, when you need to get in shape, do whatever it takes. For some, the Proform elliptical exercise equipment with entertaining bells and whistles is what it takes.